There are a number of commercial roofing companies out there but very few of them can compete with the level of experience that Empire Contractors has in this industry. We help the people of Grand Rapids, MI with their commercial roofs. Empire Contractors takes on jobs of all sizes. So, whether you need a roof replacement or a roof repair, give our team a call at (231) 578-4760. 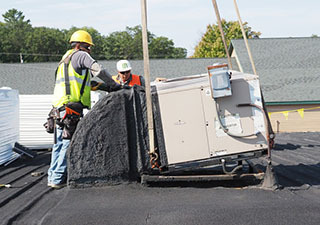 The roofers at Empire Contractors have decades of experience. 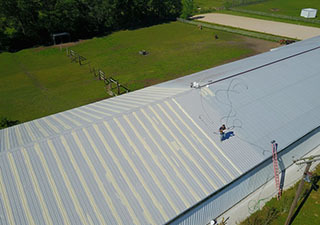 For over two decades now our team has worked on a wide number of commercial roof types. Whatever roof you have installed isn’t going to surprise us. We’ll take the proper steps throughout the process to ensure that your roof is set up for the long run. When you hire Empire Contractors to inspect your roof regularly, you’ll be rewarded. Not only will your roof stay in great condition for longer but you will also spend less money on repairs. Our roof leak detection will pinpoint your roof’s leaks and allow us to patch them up in a timely manner before the leaking water causes chaos beneath your roof’s membrane. A roof coating is an extremely effective service that will greatly improve the condition of your roof. After we take a look at your roof, we’ll let you know whether or not the time is right for a roof coating. Once this seamless protective layer is applied, your roof will be ready to last several more years without an issue. Not only does this thin membrane protect your roof from water but it also protects it from the sun. In fact, the reflectivity of a roof coating can make for a significantly more energy-efficient building. We’re ready to give your roof whatever it needs, whether that be a repair, a roof coating, or a replacement. The team at Empire Contractors looks forward to helping out more people in Grand Rapids, MI. You won’t regret hiring us because we provide top customer service and expert craftsmanship. Over the last 20+ years, we’ve earned our spot as one of the top commercial roofing companies around. When you’re ready to have your roof inspected, give us a call at (231) 578-4760.